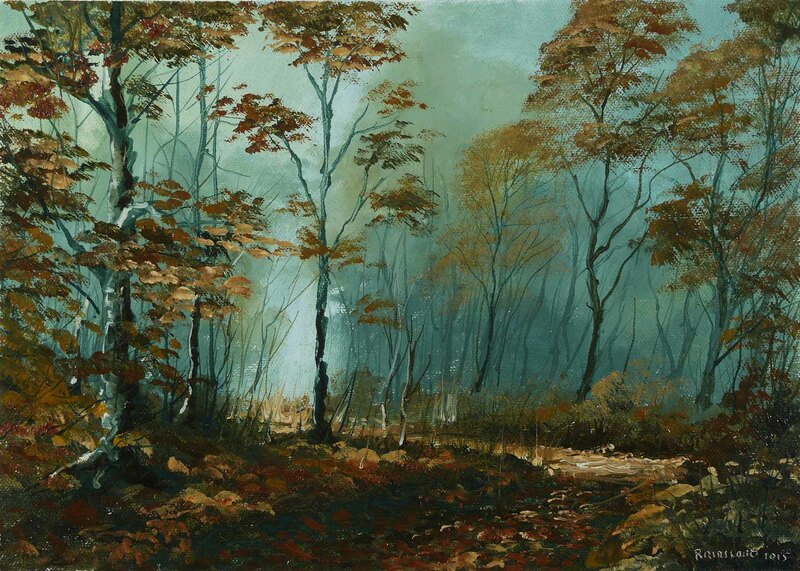 Golden browns against the misty blue/green of the deep woods was the inspiration for this morning scene. A lack of rainfall and wind has left the foliage on many of the trees but this is set to change, the storms are coming in from the west. The background is painted dry and thin. The only solvent was in the initial raw blue. Yellow and white were added to produce a thin transparent gradient. The distant trees were the same 2 colours, just thicker paint and less white. In fact, the only white was what was left on the brush from the previous mix (I’m using a single brush for the entire painting). These trees had shape and definition which was lost in the blending but I think was necessary for a natural effect. The blending of colours at this stage will make the later fine lines easier to apply. The distant leaves are brushed into the background and the white in this background colour, changes the rich browns to a softer tone. How different this is to the same colour placed on top of the background as in the foliage in the left foreground. All paint in the later stages had quite a lot of solvent. It has to be ‘wetter’ than the layer onto which its applied, otherwise the under layer is lifted off the canvas on the brush. As usual I used just 3 colours, Yellow Ochre, Burnt Sienna and Prussian Blue, plus black and white. I used a single flat filbert bristle and a fine ‘liner’ for the thin lines of trees and branches. The size is 12″ x 9″ and was painted in a single session of about an hour and a half. This entry was posted in Oil Painting and tagged Art, autumn, Culture, Irish landscape, Oil Painting, Pictures, Time lapse painting, Trees. Bookmark the permalink. please advise what solvent you are using. Turpentine ? The solvent I use is White Spirits. This is a petroleum spirit, less toxic than Turpentine. It is also much less viscous than Turpentine which suits my very ‘liquid’ method of painting. This is awesome. Loved the timelapse. Ces nuances de couleur sont magnifiques,c’est très beau. Merci Marie. Je suis heureux que vous ayez aimé les couleurs. I love this wood painting; and that time-lapse was a great insight into the process, thanks for posting. I really like your painting – it’s beautiful. Watching you paint in time-lapse is a real joy! Really beautitul and bright colors! I did not know that October had these colors. Of corse, I live in Brazil and we do not have characteriric fall colors. Best, Tânia. Brazil, what an exotic place. Your landscape never sleeps. We have 6 months of short days and long nights So different from Summer which is like another world. The light, or lack of it, and the sky is forever changing. Endless variations and yet so similar.